We had a great day today! It started of with PT and then OT. She did great in PT. Makenzie sat for a long time pushing with both her right and her left hands!!! She rarely if ever pushes through her left hand! Yeah Makenzie!!! She side sat pretty good and was very happy. She didn't eat to well today but I think that is because I have been feediing her for about 20 hours a day. She probably is not very hungery! However this morning she was up to 23 lbs 10 oz!!! Thank You Jesus!!! Ypu can see fat on her now!!!! We met with Child Find and it went VERY well. Thank You all for the prayers and thank you God for hearing and answering! We deceided that Makenzie will go to a school about 5 min from the house. The staff has been working together for a long time and it is a very established program. We will be righting into her IEP a time and person that will tend to her needs at all time while in school. She will not have a specific aid... that was not the point I just wanted to make sure that she had someone to help her be a part of the class at ALL times!!! Well, it is going to happen and be in writing on her IEP. She will not be starting school untill the end of Aug because this school in on a traditional schedule. All in all it was short and sweet and to the point. 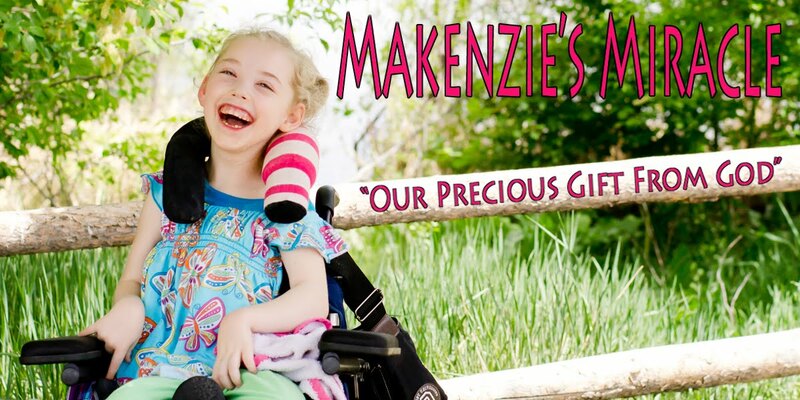 We will be meeting again befor the start of with the staff of the school and Child Find to discuss the detail of what Makenzie will need and what services she will receive! This afternoon Makenzie must have been worn out because she feel asleep in the middle of our family room and slept for almost 2 hours. It was so cute seeing as how she NEVER does that! When she woke up I decided to take the kids to the park. I loaded her up in her new chair and we walked there. She loved it! She could sit staight up and see everything!! She loved watching her brothers on their bikes and scooters! When we got to the park she swang, stood by the rope ladder, swand on the bar above the slide, and when slid down the slide!! She had so much fun! She loves everything about the park. As soon as I figure out what we have to do for Make a Wish will will be asking for a big playground in the back yard for all of the kiddo's to enjoy! We also got one step closer to the Hyperbaric Chamber being ready to go. We ordered some flow valves and they were the wrong ones so we are waiting on that and then it will be DONE!!! I can't wait. I got in it tonight and preasurized it and it worked GREAT! I am going to try to get Makenzie in it tomorrow to try and get her used to it a bit befor we get the valves and have to start using the iky hood! Pray that this goes well and we don't have any problems with her ears! Thanks for all of your thoughts and prayers!!! They mean A LOT!!!! Keep storming Heavens Gates for Makenzie!! Believe Prayer Works!! !